Fremantle has won comfortably in its biggest comeback from a quarter time deficit (20 points) since 2013. After that the Dockers recorded 11 more clearances, 32 more contested possessions, 17 more forward 50 entries and nine more goals than the Blues. Hayden Crozier has equalled his personal best of three goals following an assist from Michael Walters, who also has three. Only six Dockers have kicked majors, but four of these have kicked multiple goals. Once again Michael Johnson has been an asset for Fremantle both with and without the ball, winning a teamhigh ten intercepts (with five of them marks). Two of these launched goals to the Dockers in the third quarter. After 14 minutes, from outside 50 metres Sam Docherty has kicked his first goal of the season and the first score of this quarter. He has won a gamehigh 12 intercepts and with 24 disposals is encroaching on his season average of 27. We are ten minutes into the final quarter and time is running out for Carlton as neither team has managed to score. There have only been six disposals in total between the two sides inside their respective forward 50 zones in this quarter. Blues InterchangeTom Williamson off due to the blood rule. Blues InterchangeSam Docherty off due to the blood rule. The heavy rain is back at Subiaco making things difficult for Carlton to mount a comeback. The Blues have won all four clearances this term and recorded all three forward 50 entries, however haven't scored from its two shots at goal. After a clearance dominance in the second term, Fremantle was able to capitalise from intercepts in the third quarter. The Dockers won 16 midfield intercepts and launched five goals as a result, while the Blues won 20 midfield intercepts for one major. Fremantle has kicked eight of the last nine goals of the match, pulling away from Carlton who may be fatiguing with both Sam Rowe and Dale Thomas off the ground due to injury. The Dockers have now won six of their nine third quarters this year. That's another forward half intercept launching a goal for Fremantle, with all four goals to the Dockers from that source this quarter. Walters has kicked of these majors, coming off a careerhigh 38 disposals last week against Richmond. Repeat forward 50 entries are paying dividends for Fremantle this term, winning eight forward half intercepts and taking four of them inside forward 50. Three of the resulting possession chains have ended in goals. 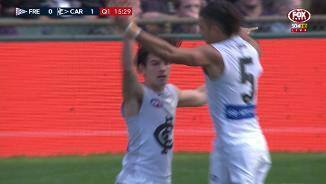 Carlton has paid the price for turnovers from both of its rebounds from defensive 50 this term, with Nat Fyfe intercepting both and launching goals to Michael Walters and now Shane Kersten. Levi Casboult has taken his first mark inside forward 50, taking his team's tally to six while Fremantle has not registered any marks in that zone. Unfortunately for the Blues, they have just managed 1.4 (10) from shots from marks. 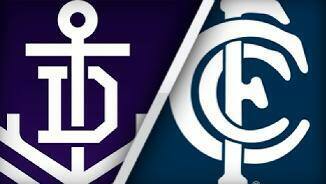 Fremantle has hit the lead for the first time in the match after Carlton led for the previous 58 minutes. All but one of the Dockers' seven kicks have been effective this term, while for the Blues four of their six have been ineffective. Aaron Sandilands was a huge influence in the second quarter with 12 hitouts and eight of those to advantage. The veteran ruckman singlehandedly launched four scores for the Dockers that term, including three out of their four goals. Fremantle is right back in the game after a commanding performance around the stoppages in the second quarter. After they won four fewer clearances in the first stanza, the Dockers won 10 more clearances than the Blues in the second term. Lachie Neale has added a goal to his gamehigh 20 disposals in the first half. Amazingly this is the 11th occasion in his 101-game career that Neale has had at least 20 disposals before half time. Crozier breaks the deadlock with his second consecutive goal coming almost 16 minutes after his previous. This quarter the Dockers have lifted their intensity with 14 more uncontested possessions than the Blues, after 13 fewer in the first term. It's been ten minutes now since either team kicked a goal. In this time neither side has looked particularly threatening, with Fremantle entering forward 50 on four occasions and Carlton just three. Carlton has taken the first five marks inside forward 50 for the match, with Jack Silvagni taking three of these. Unfortunately for the Blues forward he has only managed two behinds from his first four shots at goal. The Dockers are beginning to assert themselves at the stoppages this quarter, winning five of the first six clearances, led by Sandilands with three hitouts to advantage. Three of these clearances have shots at goal, resulting in 2.1 (13). Bryce Gibbs has been an important player for Carlton, with an equal gamehigh 11 disposals and a team-high three clearances. He now also has kicked his fifth goal of the season and the Blues' fifth of the match. 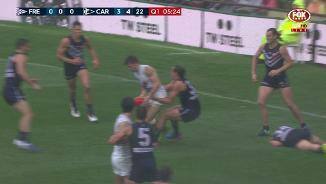 Fremantle has turned the tables on Carlton to start the second term, denying its opposition the ball. The Dockers have won the first two clearances and recorded the first eight disposals of the quarter leading to the goal to Shane Kersten. Blues InterchangeMatthew Kreuzer off due to the blood rule. Carlton enjoys its largest quarter time lead this year and largest in an away game to Fremantle. The Blues were too good in all facets, recording 78 kicks at 72 per cent kicking efficiency compared to the Dockers with 38 kicks at 37 per cent efficiency. Blues InterchangeSam Rowe and is possibly out for the game. Bradley Hill has finally put the Dockers on the scoreboard with a goal on the run from outside 50 metres. Across the past two weeks, he has averaged competition highs of 18 effective kicks, 14 marks and 767 metres gained per game. Carlton has got a huge jump on Fremantle, with a 28point lead earned through ascendancy both with and without possession. The Blues have recorded 43 more kicks and 32 more marks than the Dockers, but have also applied two extra tackles. Wherever you look the numbers are favouring Carlton. The Blues have already won 17 intercepts (with four intercept marks) compared to just 11 by the Dockers. 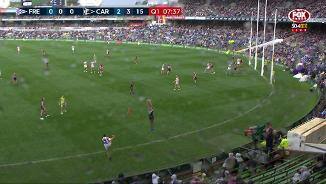 Carlton's work in tight at the stoppages has been a feature, already leading Fremantle with seven clearances to one. The Blues have won six of these inside their forward half, now launching two goals as a result. Conditions are now considerably more difficult with pouring rain now at Subiaco. The Blues have registered the first nine forward 50 entries of the match, with 38 disposals in their forward half compared to just four by Fremantle. Carlton is showing patience and some intent to control possession by foot, already with 21 kicks with 15 of them short. The Blues average 229 kicks per game this season, ranked second in the league. Fremantle has just registered one kick so far. Through the dominance of Aaron Sandilands, who averages a leaguehigh 46.5 hit-outs per game, Fremantle has been a strong stoppage team this year. The Dockers have scored from 42 per cent of their forward half clearances this season (ranked first). The Blues average 19.8 points per game scored launched from clearances (ranked 18th) and have been outscored by an average of 13.8 points per game from that source this season (ranked 17th). Welcome to Domain Stadium for the Fremantle v Carlton Round 9 clash. 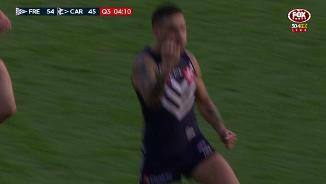 REBORN Fremantle has surged into the top eight after prevailing over an undermanned but dogged Carlton by 35 points in wet and slippery conditions at Domain Stadium. 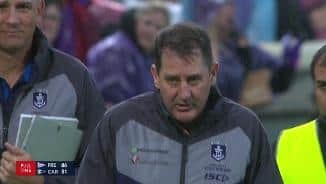 As inconceivable as it seemed after a disastrous 0-2 start to the season, Ross Lyon's more youthful and resilient outfit has climbed off the canvas to suddenly sit fifth on the ladder. Incredibly, the Dockers' percentage is just 90.7 – the fifth-worst in the competition – but they once again found a way to win in Sunday's scrappy 13.8 (86) to 7.9 (51) triumph. 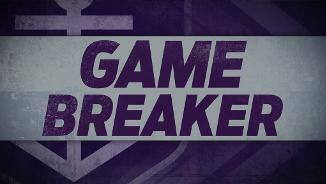 Fremantle's sixth victory from seven games was another comeback special, this time from 28-0 down in the first quarter. Freo was dragged back into the contest by ball magnet Lachie Neale (37 disposals, one goal) and giant ruckman Aaron Sandilands' influence at stoppages, but it was Michael Walters' magic that broke the Blues' resistance. 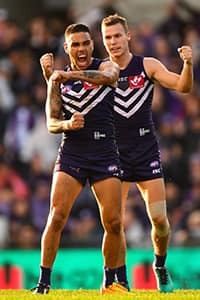 Walters ended his four-game goal drought early in the third quarter when he put the Dockers ahead for the first time and ignited a five-goal-to-one term. The star small forward, thrown back into attack following Stephen Hill's subdued return from injury, then added a near carbon copy goal and rolled through an instinctive third major as Freo surged to a 22-point lead at the final change. 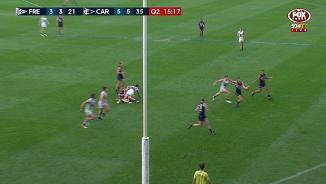 Carlton, without Sam Rowe (knee) and Dale Thomas (blurred vision), refused to go away but didn't have the manpower or firepower to muster a serious fightback. However, the Blues deserve credit for another competitive showing coming off wins over Sydney and Collingwood, plus a spirited loss to St Kilda last round, and they landed first-quarter body blows on Fremantle. In driving rain, Brendon Bolton's men executed his precision-kicking gameplan (78-37) to perfection, and alarm bells were ringing when Thomas' miraculous banana and Marc Murphy's snap as he was tackled to the ground both sailed through. Bronx cheers greeted Fremantle's first inside 50 at the 18-minute mark, but Bradley Hill's running goal gave the Dockers some impetus and they got to work at the coalface as the rain eased in the second stanza. 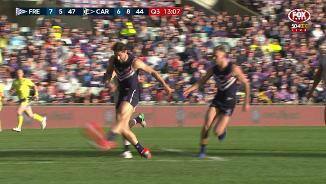 The Dockers dominated contested ball (45-25) and clearances (13-3) on the back of Sandilands' efforts, booting four goals to Carlton's one to only trail by two points at the long break in a strong response. "It was really pleasing. 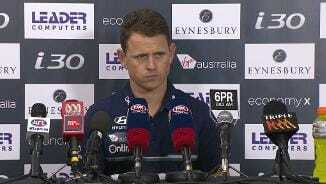 We were disappointed with our first quarter – it was the last thing we expected – we thought we'd planned and prepared, but to Carlton's credit they jumped out of the blocks," Lyon said. "We adjusted accordingly at quarter-time and I thought from there we played very well and they persisted and fought (it) out." Neale ran rampant in custom-made conditions and tagger Connor Blakely (33) was prolific again in an even battle with Murphy (32, one goal). An equal career-best three goals from Hayden Crozier – two in the second-quarter surge – were telling, while usual suspects Nat Fyfe (30 dispsoals) and David Mundy (28) gave their all to secure another victory. 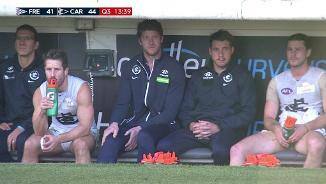 Carlton's vaunted engine room – led by Bryce Gibbs (34), Ed Curnow (31) and Matthew Kreuzer (22, 26 hit-outs – fought hard but the Blues struggled to find an avenue to score, with Levi Casboult (two) the only multiple goalkicker. "It was a game where it was difficult to score (in) wet conditions like that," coach Brendon Bolton said. "Probably some of our entries we can have a look at as to why - we probably tried to bite too much off - but that's about playing to the conditions." With a clash against North Melbourne to come, the Blues will be sweating on the fitness of Rowe after Fyfe came across his kicking leg attempting a smother in the early exchanges. The big defender tried to return late in the opening term with his knee strapped but his legs buckled in a marking contest and he played no further part, while Thomas missed most of the second half after colliding with former Docker Alex Silvagni. 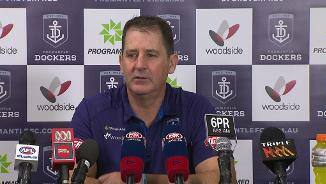 Fremantle: The Dockers appear to have emerged unscathed. Carlton: The Blues are uncertain about the extent of Sam Rowe's knee injury and he will have scans in the coming days. Dale Thomas was concussed and battled blurred vision and will be monitored ahead of a clash with the Kangaroos. 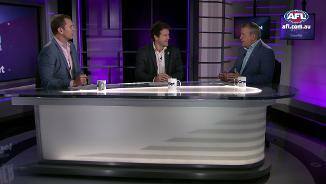 The Dockers are on the road for a genuine test of their finals credentials against League leaders Adelaide, while the Blues will take on North Melbourne after the Roos breathed life back into their campaign with a win over Melbourne.